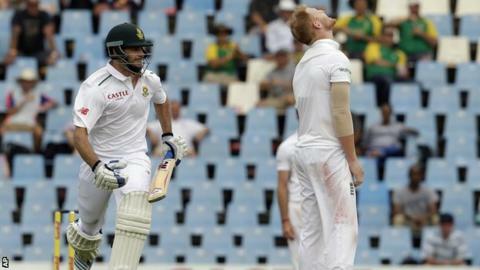 England's performance on day one of the fourth Test against South Africa was very mixed. Though they improved in the final session to leave the home side 329-5 at the close, England were lacklustre in the morning and it didn't get much better in the afternoon. Chances went down and, with the exception of Stuart Broad, the bowling just did not have the same intensity as in the stunning third Test win in Johannesburg. James Anderson is England's leading Test wicket-taker of all time, but he lacked the nip that has made him so dangerous. It's not easy for a bowler to go from being out of cricket - like Anderson was when he missed the first Test with a calf injury - to returning and playing three successive Tests. Anderson has overs under his belt, but is without rhythm. Today, he was warned for running on the pitch, an offence for which he was removed from the attack in the first innings of the third Test. To me, an old bowler, that is a tell-tale sign that Anderson is lacking that rhythm. Some bowlers naturally encroach on to the pitch in their follow through, but Anderson is not one of them. This is to do with the way his action is going, how is body is coming through, where his right leg is landing. They are tangible examples of a lack of rhythm, which itself can be intangible and hard to recapture. After this, the Lancashire pace bowler will have a good break and come back for the English summer. Then he will have the Dukes ball he favours in his hand, rather than the Kookaburra version which does not swing quite so much. England will not yet be concerned about Anderson, but they might be if he returns in May still bowling like this. It was Anderson that served up the leg-stump half-volley that gave Stephen Cook a boundary from the first ball he faced in Test cricket. From the outside, the selection of Cook, a 33-year-old, when the series was already lost, did not look very forward-thinking from South Africa. Cook, though, played extremely well. He is clearly a very experienced cricketer who is sure around off stump and knows the areas in which he can score. He may not have the same amount of shots as his father Jimmy, himself a former South Africa international and here to watch on Friday, but he knows what the game is about and that is what South Africa need at the top of the order. He got slightly nervous in the 90s, but that is understandable. On the whole, he was unflustered and his completion of a debut century was a wonderful moment in a series that has been full of them. South Africa have tricky series against New Zealand and Australia coming up - they will need his quality opening the batting. For much of his innings, Cook batted in tandem with Hashim Amla, who compiled a gorgeous century. If you think back to the brutal hitting of Ben Stokes in his 258 in Cape Town, then you can't really say that Amla's century in Pretoria is the innings of the series. What is undeniable is that it was full of aesthetic quality and classy strokes, and so much more beautiful than his own double hundred in the second Test. When Amla is playing that well, there is no other batsman in the world that can match him for graceful strokes, timing and field piercing. He just plays the ball so wristily and so late. One shot, a drive through the covers off Moeen Ali, stopped everyone in their tracks. It was the wicket of Amla, who played on off Stokes, that saw England begin to claw their way back into the game during the final session. From 224-1 at tea, South Africa found themselves 273-5 as England's bowling improved and the home side played some poor shots. Even though Temba Bavuma and Quinton de Kock would go on to score quickly against the second new ball, England still have the chance to bowl South Africa out for something manageable. For much of the day, that did not look likely.